Looking for some troubleshooting information about the IQ motors.2 different issues. Second, we have a couple motors that don’t work. When plugged into the brain, they are not recognized. Not recognized on VOS no matter which port they are plugged into. Should I throw them away, or is there something I can do to fix them? 1- Yes, motors do wear out. We lost a few during the year. Also, some motors are not as strong out of the box as others. We built a miniature dyno by hooking a motor up to a 64T gear connected to a 12T gear. Then we attached an small beam to the 12T. We then hooked the motor up to the brain and apply full power to the motor. We put a weight on the beam, moving the weight out further until the motor couldn’t turn it. This we decided was the Stall Torque of the motor. Not exactly power, but we found the motors with the highest stall torque helped cross over the bridge better. New motors were not always the strongest, but we did have some really old motors which didn’t perform well on this test. See the picture below. 2- The only possible way to bring them back that we have found is to unhook everything from the brain and place the motor in Port 1 then run VEX OS. This doesn’t work all of the time. The Tech at VEX explained at sometimes turning the motors when they are not hooked up will cause them to lose whatever coding they have. I can’t confirm or deny this. If you have a handful it would be worth calling VEX to see if they would warranty them. Definitely don’t throw them out. Send them back to Vex, they seem to be having some low level issues with motor and sensors in this regard and the more they get back the more it will help them correctly diagnose and fix the problem. If it is an issue with motor rotation, then I imagine the Back EMF generated by spinning the motor may be corrupting the flash memory. One thing to be careful of when running the dyno test is there may be some code in the smart motor that tries to act like the “PTC” in the VRC motors. In this case, it would try to integrate the power delivered to the motor and turn down the max power delivered over operational periods. Not sure, but hoping to experiment with this. So, if you are characterizing the motors then make sure you unpower them and the brain each time you move the tire in your dyno. We did this type of characterizing for VRC this year with 70+ motors to get the best ones for the base and lift. The “goodness” was all over the map, and certainly the new ones were not always the best. Thanks all. That is great help. I’m curious to see the results. I just took Uncchs9’s idea of a test bed and constructed my own. I have a club and students who use motors out of the same bin. I tested a dozen motors today and found the power levels varied. 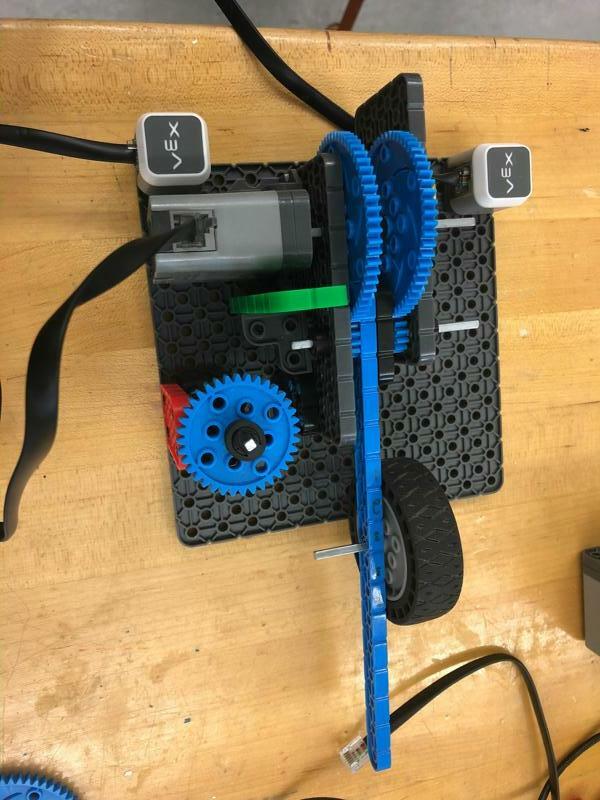 For my sixth graders running a Drive A Bot on a tile floor all the motors above a two will work but for my robotic students, I will have them test every single motor before they add it to a robot. I set up a simple code that runs for …5 seconds and then repeats until I press the stop LED.